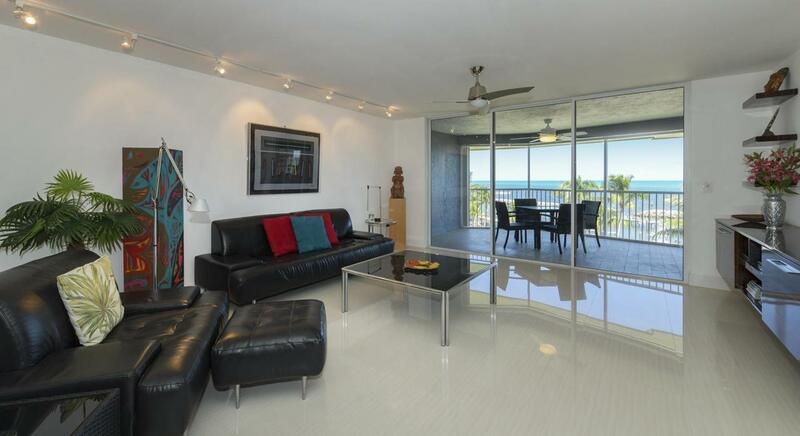 Exquisite penthouse at Islamorada's premier oceanfront gated community with 30' deeded boat slip #14. The panoramic ocean views from this top floor 2 bedroom, 2 bath condo are seen from the living area, kitchen, dining area and master bedroom! Completely updated with large format 24x48 color-body porcelain floors and Karastan/ New Zealand wool carpet in both bedrooms. The custom European style kitchen with Bloom hardware offer high end stainless steel appliances, exotic granite counter tops with full backsplash, waterfall peninsula and kitchen nook with granite desk top. The master bath features custom wall mounted floating vanity and jetted full body shower panel with rain shower and hand-shower. Custom cabinetry in kitchen, living area and bathrooms. The spacious outdoor living areacan be accessed from the living room or master bedroom. Very private low rise complex offers oceanfront swimming pool and jacuzzi, owner's club house, gym, sandy beach with tiki huts and grilling area, large marina and lighted tennis courts all on 12 beautifully landscaped acres! Being offered furnished and "turn key". Flood Zone Ae Ae Ae Ve Ve Ve 0. Listing courtesy of Kim Bagnell Thaler of Ocean Sotheby's International Realty.